A spotting scope might seem like a strange tool to use for birding. They’re big, heavy, and not very mobile—unlike the very mobile nature of birds. One minute, you’ve got eyes on the most beautiful pileated woodpecker you’ve ever seen and are getting your camera out. The next, you’re looking at an empty tree and can almost hear Woody Woodpecker’s cry mocking your slow speed. We checked out some of the leading models on the market and wrote reviews of them. We like to think of our reviews as a starting point, however, rather than a destination. We really think you ought to do some additional homework in order to discover the birding scope that’s right for your needs. We hope you find both sections valuable and that both help you pick the scope that’s best for you. The Celestron 52305 Regal M2 features a top-of-the-line prism with low-dispersion glass and coated optics to help maintain sharp images. It also has a large objective lens to help gather as much light as possible in overcast conditions or at dusk. It’s also waterproof—if it rains or fogs, moisture won’t seep into the body of your scope. What we didn’t like was the eye relief, that space between the ocular lens and your eyeball. It’s pretty narrow, so if you wear glasses that will be an issue. We also found that the benefit conferred by the large objective lens tended to be diluted when used at higher magnifications. It’s also (no surprise here) pretty pricey. The best way to describe the Vortex Optics Diamondback is that it delivers big things in a really small package. It maintains sharp, colorful images in a lightweight, compact frame so that you can feel like you’re up close and personal with the birds you’re tracking. The optics are superior and maintain details that are critical for a good birding scope. It’s also water- and fogproof; if it gets wet while you’re out in the woods, you don’t have to worry about moisture getting into your scope and ruining your images. 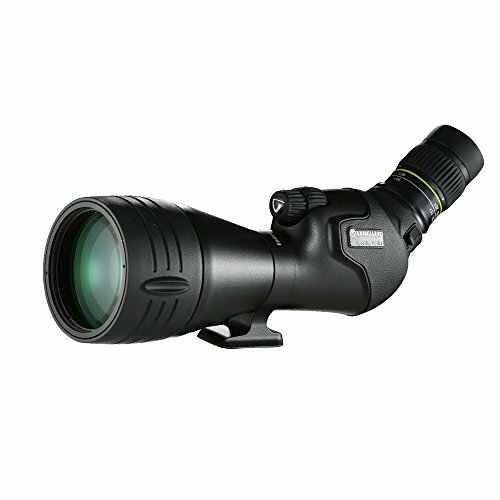 The scope also comes with a built-in sunshade, which is handy during sunny, cloudless days. Focusing can be a bit of a trick, but that’s not the real drawback. The real drawback is the price. This one is really expensive. You get a lot of scope for it, but you can get comparable quality for less. That’s why we dropped it to the runner-up spot. 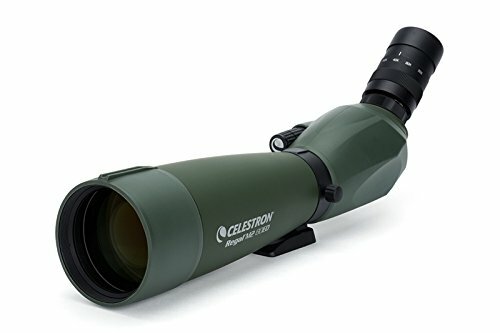 Related to our top pick, the Celestron 52250 Ultima Zoom packs great optics into a waterproof frame. It will let you scope out birds from a comfortable distance with details that will enable you to identify their species with confidence. It’s also pretty affordable, which is why it gets our “Best for the Money” choice. It’s got great features for its optics. The multi-coated glass will reduce light lost due to reflection and will help keep images looking fresh and sharp. It’s also got a nice large objective lens to help gather light in low-light conditions like dusk and on overcast days. What we didn’t like was the eye relief, that space between the ocular and the eyepiece. If you wear glasses, they will get in the way. We also found the weight distributed poorly, with more of it on the front end than the back. It might tip during use if you’re not careful. Vanguard’s Endeavor has all the right features for its optics. It just somehow can’t pull it all together and deliver the goods with them. It’s not a bad scope for birding. It’s just not a really good value. We can’t quite understand it. It’s got low-dispersion glass and coated glass to help keep images sharp and reduce color bleeding. It’s lightweight but durable, and it’s waterproof to keep water out if it rains or gets foggy. It has a lot of potential, but the scope just can’t seem to live up to it. The images, for all the features, just aren’t all that sharp and are just about grainy in low-light conditions. It’s not as costly as some of the other models we looked at, but it’s still a pretty underwhelming scope. It’s also not a very good value as a purchase which, considering the price, is a pretty serious drawback. 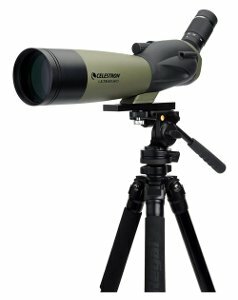 TASCO’s World Class isn’t a terrible scope for birding, it’s just an awfully large scope to lug around when chasing birds. Of course it’s big, and it’s got a nice-sized objective lens that needs to be supported by a frame of similar size. It’s also—compared to the other models we looked at—pretty inexpensive. It’s also weatherproof, so it’ll keep the rain and fog out. Beyond that, it’s just not a very good scope. Its images are of the kind of quality you’d expect to get from a scope of this price. There aren’t a lot of extras to help clean up the images. What you see is what you get, plus distortion, blurring, and color bleeding. It also comes with a tripod, which we suggest that you throw out with the packaging. Get a different one. You’ve read what we think about how some of the leading spotting scopes on the market apply to birding. But, you’re thinking that we really didn’t fully account for the environment in which you watch birds. Perhaps you think that we didn’t hit quite all the right notes for your own personal satisfaction. We’re actually okay with that. In fact, considering the investment, we would encourage you to do further inquiry until you’re absolutely happy with a scope model. So, we’ve put together this buyer’s guide to help you figure out how we arrived at our conclusions so that you can help shape your own search. If you’re using a spotting scope for birding, you’re watching birds from a pretty good distance. If you’re close, a monocular is more compact and handy, while binoculars usually offer a better optical experience. So, the things you base your purchase on are factors that account for long distances; address those shortcomings and make the positives as big as possible. Viewing anything from a distance requires features that will negate reduced image quality and size of the image. The first of these is the optics of the scope themselves. If you’re birding, the details of each bird are important. So you want the image you see in your ocular to look like it will if you’re standing right next to it. That means looking for scopes that incorporate low-dispersion glass in their manufacture and coatings. Low-dispersion glass helps manage the different color elements of visible light waves to reduce color aberrations. It makes for more clear images and the preservation of details. Coated optics, the objective lens and internal prism, help reduce the amount of light lost to reflections off the glass. More light means sharper, more vibrant images, which is just what you want when watching birds. A large front lens, called an objective, will allow more light into the scope. This means better imaging at dusk or when it’s dark outside. Since a lot of birds are more active during periods of low light, this is probably an underappreciated feature. You’ll want to weigh this with the general weight of the scope, because larger objective lenses are also (surprise, surprise) a little heavier. Given the mobile nature of birds, this could be important if you have to move around a few times in order to follow them. On the other hand, a scope with superior internal optics will generally produce a better image. If your choice is between an excellent scope with a smaller objective or a so-so scope with a large objective, go with the smaller scope. The field of view is really how much ground you can look at through your scope. If you’re looking at a stationary target or keeping an eye on one specific piece of real estate, you can get by with a small field of view. If you’re tracking animals that are mobile (ding, ding, ding … we’re talking about birds) then you want a bigger field of view so you can see them and zoom in for details. Or, watch them over a larger area to see what they do. Because image control is important when using a spotting scope, making sure that the scope is built for the environment is pretty important. 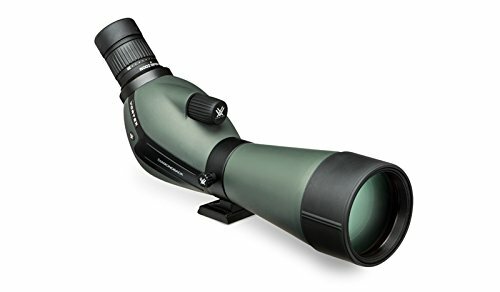 If you’re watching birds through a non-water resistant scope in the middle of the rain or a suffocating fog, chances are good that you’ll get moisture in your scope which will fog it up internally. That’s, well, bad. 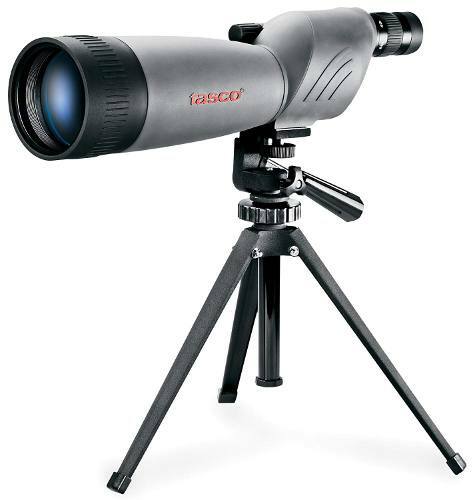 Unless you watch birds for a living, a spotting scope for birding is definitely a luxury purchase. So, you can afford to set a budget and stay within it as long as you hit the high notes of what you need. A lot of the fancy-sounding components, like low-dispersion glass, were a lot pricier a few years ago but have really come down in price as they’ve become more standardized in products. So, you can have a budget and still get a pretty good scope for birding. In our reviews, the Celestron 52305 Regal M2 was the king. You pay for it, but you get quite a lot for the price. The Vortex Optics Diamondback was a reasonably close second, but price and difficulty in focusing brought it down in our eyes. 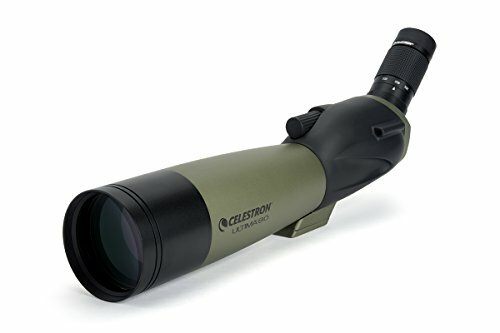 The Celestron 52250 Ultima Zoom was our “Best for the Money,” out-delivering in quality while under-demanding in price. We felt the Vanguard Endeavor simply didn’t live up to the potential of its features. The TASCO World Class was a bit too big to carry around for birding. They could have taken the money they spent on what is an atrocious tripod and put it into better optics. We hope you found our reviews helpful and took something from our buyer’s guide that will help you make a better choice in buying a birding scope for you. We wish you the best of luck in finding new and interesting species of birds.